The Hubble Space Telescope has observed a fourth moon orbiting the dwarf planet Pluto, this one a tiny satellite with a diameter of no larger than 21 miles. The moon, which has been labeled P4, joins Charon, Hydra, and Nix among the known celestial bodies around the solar system’s former ninth planet. Stern was referring to NASA’s New Horizons mission, which will arrive in the vicinity of Pluto in 2015. He is the principal investigator for that mission. P4, whose orbit is located between those of Hydra and Nix, was first seen in images captured by a wide-field camera on the telescope June 28. 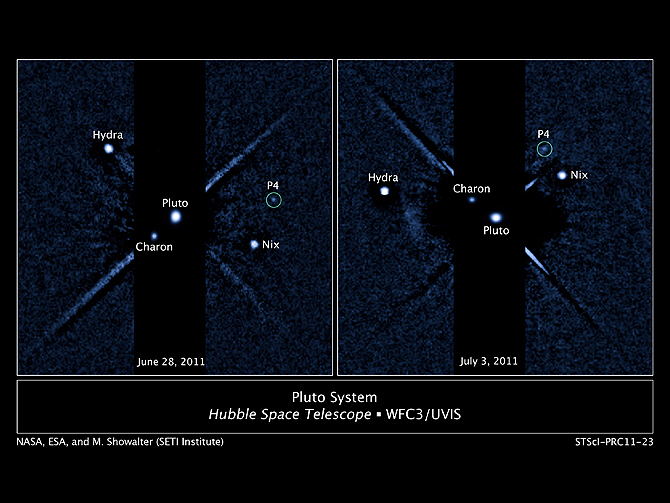 Astronomers noticed it while they were looking for evidence that Pluto has rings. To find out whether it does, the scientist need to deploy a camera that is capable of detecting very dim objects deep in space. Pluto is about 3 billion miles from Earth. Stern said that no rings have yet been found around Pluto. “But that doesn’t mean there are not rings around Pluto,” he cautioned. The discovery of P4 was confirmed in two other photographs taken by a camera on the Hubble this month. Pluto’s other moons are much larger than P4. Charon, the largest, is 648 miles across, while Hydra and Nix each have a diameter of 20-70 miles. Hydra and Nix were discovered through use of the Hubble Space Telescope in 2005. Charon was first discovered by astronomers at the U.S. Naval Observatory in 1978. Scientists believe that Pluto’s moons were created when another celestial object collided with the dwarf planet during the early history of the solar system. “The object that collided with Pluto and created its satellite system was probably about 1000 kilometers across, maybe somewhat larger,” Stern said. The newly-discovered moon will receive a permanent moniker at a later date.